DLA-X5900B uses D-ILA and 4K e-shift4 for detailed, smooth, vivid 4K images on the large screen. White model also available. Earn 4495 loyalty points when you order this item. - Projection size: 60" - 200"
JVC DLA-X5900B projector utilises carefully chosen mechanisms counting novel D-ILA and 4K e-shift4 technologies that mimics meticulous, balanced, vibrant 4K HD images on a big display just the way the movie producers envisioned. The projector contains cutting-edge HDMI and HDCP2.2 spec on both HDMI ports, adept to process file transfers up to 18Gbps, which can convey comprehensive innate 4K signals. The new projector supplies illumination up to 1800 lumens with a great natural contrast ratio of 40,000:1 for paramount whites and profound blacks. On top of this is included; Auto HDR for top UHD 4K HDR compatibility, a low latency function for enhanced gaming and Hybrid Log Gamma for impending HDR transmissions and streaming data. Hybrid Log-Gamma is a TV broadcasts standard that offers a vast improvement in quality for a more realistic visual experience that will immerse you further into the picture, allowing you to enjoy TV broadcasts like never before. This projector is capable of giving you the viewer, a cinemascope experience, with its five programmable presets for zoom. At the touch of a button, transform 1.78:1 black border movies to a full-size cinemascope when using a 2.35:1 projection screen. The projector has 136 screen adjustment modes, 10 lens memory functions as well as an automatic lens cover. The 6th generation 0.7" Full HD D-ILA (1920 x 1080) x3 device, which has an even narrower gap between pixels and is planarised, achieves brighter images rich with contrast. This projector has been designed specifically to complement ultra-high 4K resolution for increased precision of the image without a screen-door effect. Projection to 4K standard is supported entailing 3840 pixels in width by 2160 pixels in height. There is also an optical engine featuring e-shift 5 Technology with Multiple Pixel Control processing and a 3D resolution of 1920 x 1080. Pixel Adjust lets users exactly modify colour aberration in 1/16-pixel fractals as well as splits the screen into 121 points for discrete adjustment. Two personalised settings can be saved in the memory. An advanced version of Multiple Pixel Control incorporates new analysis algorithm which offers concise diagonal-detection between frames for total HD and 4K resolution. The projector is built to the latest HDMI/HDCP 2.2 guidelines for full spec 4K signal input up to 4K60P 4:4:4 HDR allowing for effortless reproduction, the projector switches to HDR picture mode when HDR10 signals are received. X5900 has dual HDMI (3D, Deep Colour/HDCP 2.2), RS-232C (D-sub 9pin), LAN (RJ-45), Trigger (Mini Jack) and 3D Sync (Mini-DIN) connectors. Using a bright 265W NSH high-output lamp and xenon lamp colour temperature, capable of 1800 lumins, this projector has high contrast ratio (400,000:1), and native contrast of 40,000:1. Two technologies are featured on the D-ILA projector, a moving image interpolation technology Clear Motion Drive that is compatible with 4K60P 4:4:4 signals and Motion Enhance technology that controls the compelling performance of D-ILA devices by optical traits. The two D-ILA technologies, means this projector is capable of reducing ghosting or afterimage issues often found with fast-moving images. For PC and games consoles fans, the Low Latency Mode prevents delays in the display for a faster response. To optimise the elements of an image, such as colour balance, gamma characteristics, colour space and colour tracking the projector has an auto-calibration function. 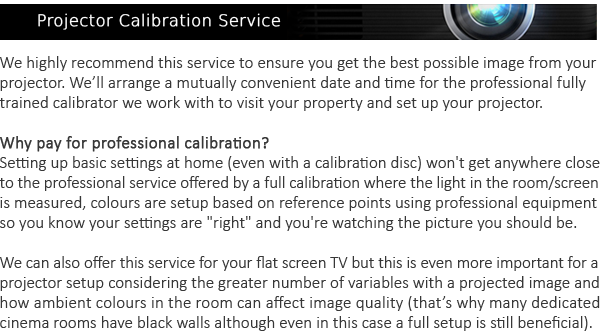 A 12-point manual gamma adjustment is included in the Auto-Calibration Software. For true stunning 4K reproduction, this projector uses Original Real Colour Imaging Technology with a new filter capable of covering the DCI (digital cinema initiatives) colour space. Motion Enhance works to prevent residual pictures and consequent blurring often found in rapid moving images by governing the power of D-ILA devices. Their are wireless options for true 3-Dimension viewing included in the form of a RF (radio frequency) system transmission with PK-AG3 3D Glasses for 100H continuous operation and PK-EM2 3D Synchro Emitter.